btw, whats up with ts and esig freezing up when we get all this volume going thru the market? anyone have a solution to that? 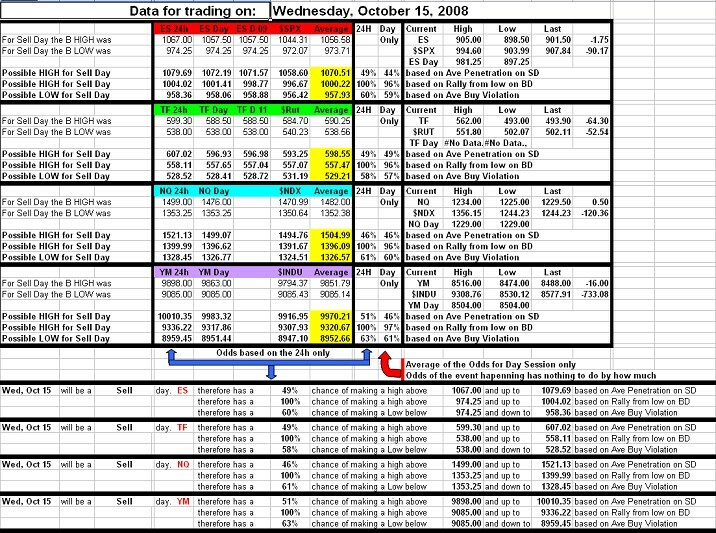 Today was a Sell day and as mentioned in last night's report we had a 60% chance of making a lower low and if we were to gap down at the open we had 96% chance of getting back above the Buy day low. Well we did all that and even got above the projected numbers for the day before pulling back a bit. Today was SS day and as I mentioned in Friday's report, based on the fact that we needed a positive 3 day rally, we ended up with a rally today and as with all the moves lately it was exaggerated but now for the way up. Today was a Buy day and on Buy days we need a decline from the SS day high. 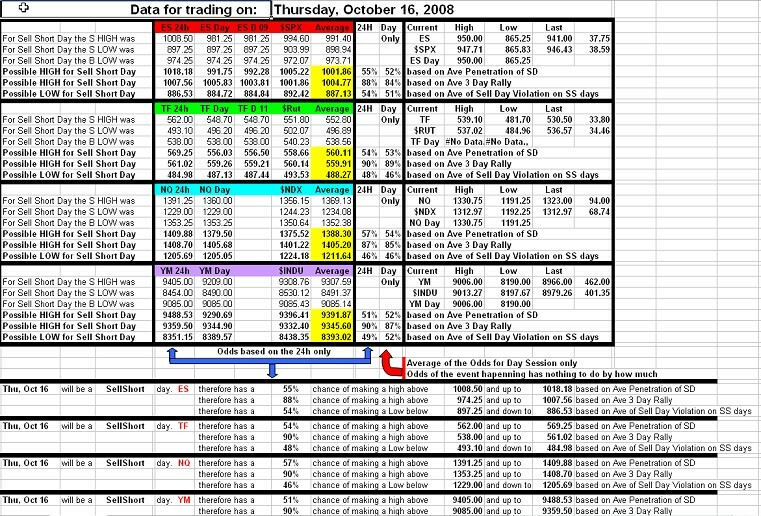 You will notice that even if we made a higher high we still managed to decline to at least the projected numbers and as mentioned is last night's report the low was to be made last and it did. Today was a Sell day and we had a 60% chance of making a lower low. On the way down we can notice that the projected lows did offer some support for a while. Tomorrow is SS day. We have 56% chance of making a lower low however we have an 88% chance of getting back above the Buy day lows. Based on average rallies that would seem impossible but with the exaggerated moves of late we never know.